No other car on the market is quite like the 2018 Dodge Challenger! The exterior of the muscle car features a really sweet old school and retro body and the interior sports some of the best technology features you could find in a car! It's the perfect mesh of a day to day errand and commuting car while still giving you the option to have a little fun on the weekends! Read on to learn more about this great muscle car! What kind of convience features do the Dodge Challenger trim levels offer? No matter where you look the interior or the exterior, there is great beauty to be found! 2018 offers four Challenger models: the base model is the SXT, and it moves up from there with the G/T, R/T and the top model the R/T 392! There are also a few sub trims that give you even more customization options! The Challenger is considered a coupe with its two doors body style, but it's got the room for up to five friends with its spacious back seat. You'll find a load of features that are standard when checking out the interior of this car! Some of those features are dual-zone automatic climate control, a rearview mirror with auto dimming as well as driver's seat that can adjust six ways! The exterior of the Challenger is also loaded with standard features like keyless entry and start, headlights that are automatic, heated mirrors and 18" wheels! If you're looking for a more advanced Challenger the R/T 392 adds features like a rear spoiler, cloth sport seats, rear parking sensors and HD and satellite radio! The trunk in the 2018 Challenger is pretty darn impressive! You'll find no problem hauling all your gear when you open the trunk to 16.2 cubic feet. If you need even more room the rear 60/40 split seat can fold down for even more cargo room! 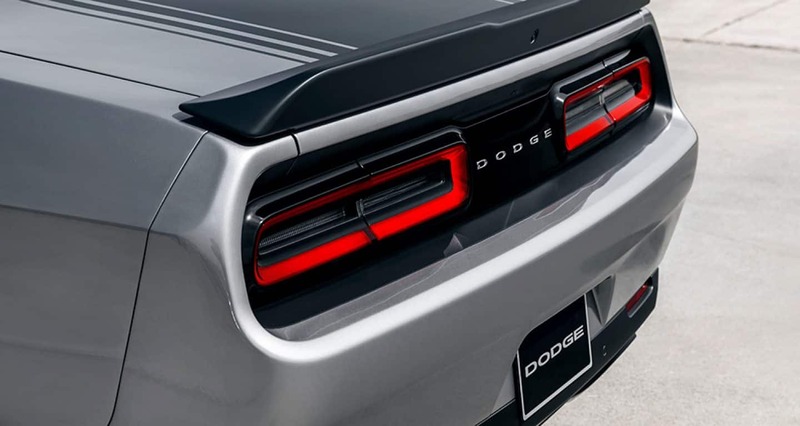 The technology was not forgotten when Dodge was designing the 2018 Challenger! You can blast some sweet tunes with the six-speaker sound system! 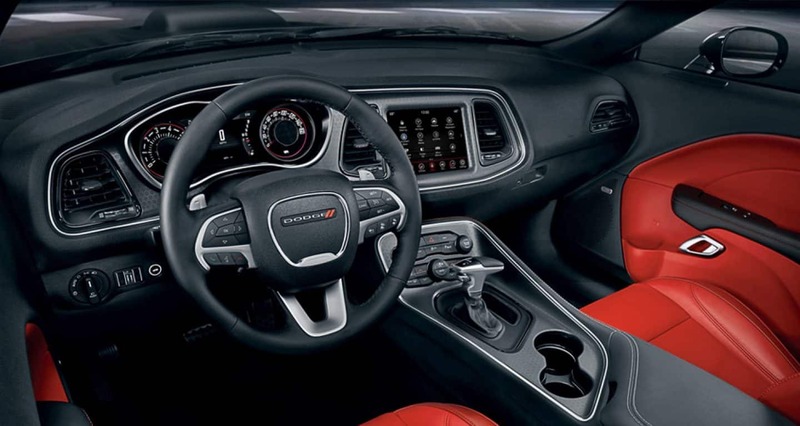 Plus there is the 7" touchscreen that comes equipped with the fourth generation Uconnect system that comes with Apple CarPlay, Android Auto, and Bluetooth connectivity! What kind of engine options does the 2018 Dodge Challenger offer? There are a ton of powertrain options for the 2018 Dodge Challenger! The SXT and GT models have a 3.6-liter Pentastar V6 engine underneath their hoods that generates 305 horsepower and 268 lb-ft of torque! 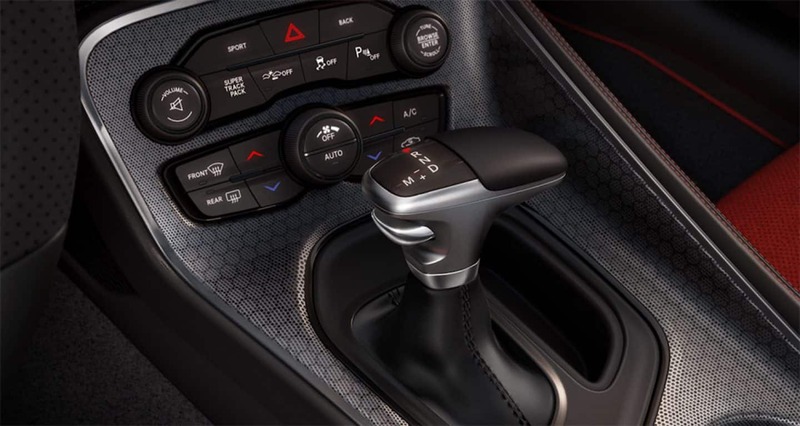 The TorqueFlite eight-speed automatic transmission is the match for this engine making the Challenger the first and only muscle coupe with all-wheel drive in the world! It's pretty fuel efficient to reaching up to 30 mpg on the highway! The R/T model gets a more impressive engine: a 5.7-liter HEMI V8 that outputs 375 horsepower 410 lb-ft of torque that can get up to 25 miles to the gallon on the highway! The R/T 392 gets the very best engine of them all: a 6.4-liter V8 produces 485 horsepower and 475 lb-ft of torque plus a sport-tuned suspension and performance brakes from Brembo! How does the Charger do in Safety tests? Are there any safety features available? This muscle car knows safety! The Challenger has more than 70 security and safety features available for 2018! These optional features include Blind Spot monitoring and rear cross path detection as well as forward collision warning and adaptive cruise control! The National Highway Traffic Safety Administration gave the 2018 Challenger 5 (out of 5) stars in the overall safety category as well as front passenger side crash safety! The only way to really know if the Challenger is the right muscle car for you is to come in and test it out for yourself! All of us here at Speedway Chrysler Dodge Jeep RAM can't wait to work with you! Come on in today to take the 2018 Challenger for a whirl!